Welcome to the Halo Wars 2 Store! 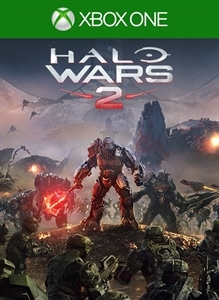 Halo Wars 2 gives you a huge collection of combat units, destructive powers, and impregnable fortresses which you can use to destroy any who dare stand in your way. The Halo Wars 2 Store is pretty much the same thing, only with tee shirts. Check out the gear below to send your Avatar straight to the newest battlefield in the Halo universe. If you growl like a Brute and you act like a Brute and you tat like a Brute…you might be a Brute. Get ready to rock Atriox’s facial tattoos from Halo Wars 2. Unleash your inner Brute chieftain with the gravity mace wielded by Atriox, leader of the Banished and scourge of Halo Wars 2. Just when you thought it was safe to explore ancient alien installations again, Atriox shows up and gives the Halo universe a new definition of MEAN. Become the MEAN with this Atriox costume! Gray? Grey? Who cares? Check out that sweet logo! Part motorcycle, part woodchipper, ALL AWESOME. Speed your way to victory in the UNSC’s newest light combat vehicle.